“If there is a heaven somewhere, I am sure there is beach attached to it”, I was remembering this good old quote while overlooking the Celtic Sea at the coastal town of Bournemouth in South England. The view of the turquoise water sure made me believe in that quote. With sun kissed skin, breeze in the hair and sandy feet, I had just begun my road trip of the South West Coast of England. The setting was perfectly fit for the summer holiday. The sun shining bright above us, bubbly waves kissing the shores and blue skies all made perfect ingredients for a perfect summer holiday. We had started our 3-day drive from Birmingham on the early hours of Saturday and were soon part of the maddening traffic that was flowing to the beach sides for the long weekend. The morning was all gloomy and cloudy with occasional drizzles threatening our holiday but we chose to move on. While in the UK, there are few things that you should ignore and weather is right at the top of this list! The forecast on the media weren’t very pleasing to hear at all. But we kept our spirits high, hoping against the hope, craning at the sky every fifteen minutes, we drove along the M40 towards the south. 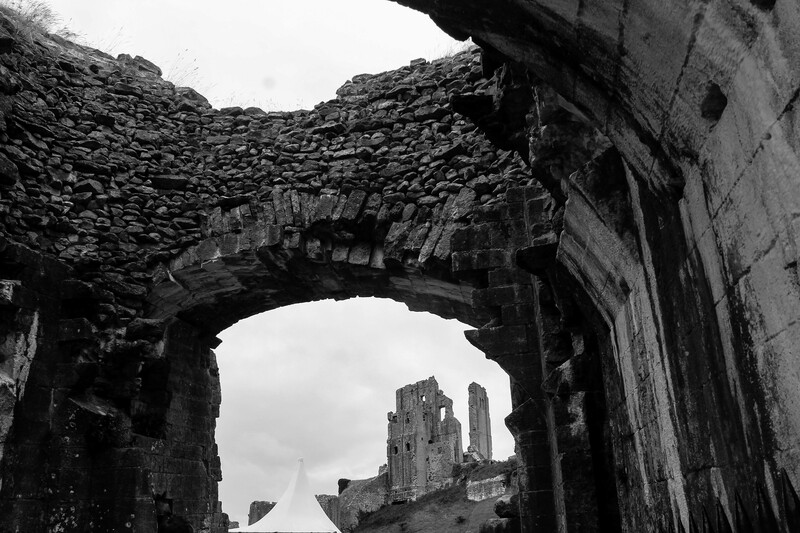 Corfe Castle is one of the prominent structures from the English civil war. Believed to be built by William The Conqueror in 6th century, this fort has gone through a lot of royalty before being destroyed by the parliamentarians during the civil war. It was here, King Edward was poisoned by his step mother to make her own son the next king of England. 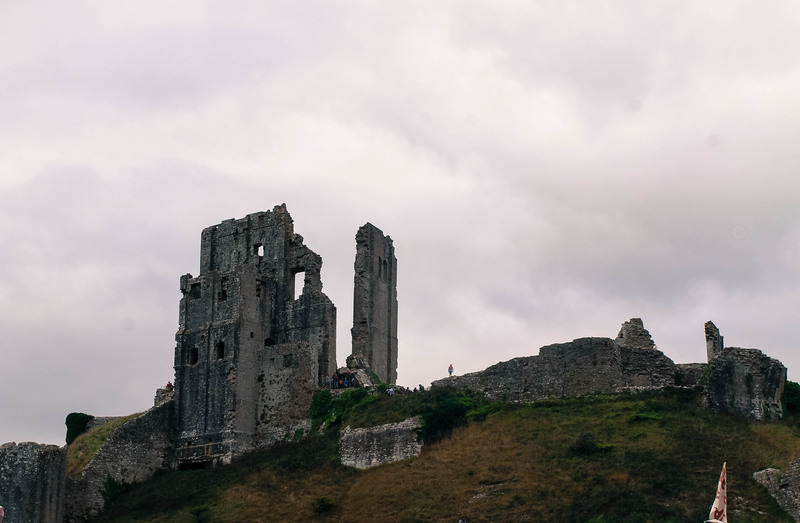 The history of Corfe Castle has many stories of treachery and murders buried with it but what stands today on this small hill of Isle of Purbeck is a thousand year old ruin. We walked around and led our way into the entrance of the castle only to find that we had to buy a ticket to get inside. Since this was not a planned stop on our trip and not finding the ticket really useful, we chose to continue after few customary photographs. 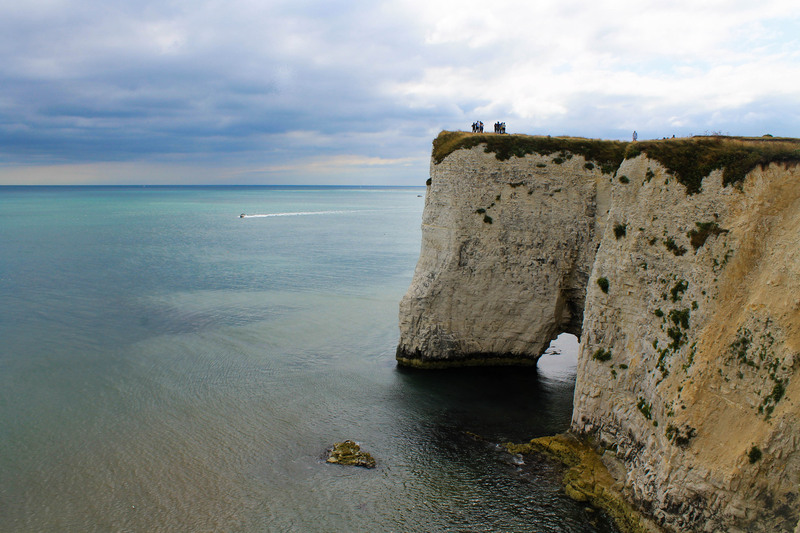 The rain clouds were not to be seen anywhere around and the blue sky got us more and more energetic now as we headed towards the Old Harry Rock in Swanage on the southern shores of England. It is short, 10 minute walk from the car park near the pub on South Sea at Swanage to the Old Harry Rock. The summer sun shone bright and we walked along the blackberry bushes. The sight on the other side of these blackberry bushes will remain in my memory forever, my first sight of turquoise sea! Waves washing up the shore and small white boats anchored in the waters! Definitely a sight to behold. Further ahead was the sight that we came for, Old Harry Rocks, the two chalk formations that stand tall in the Celtic Sea. 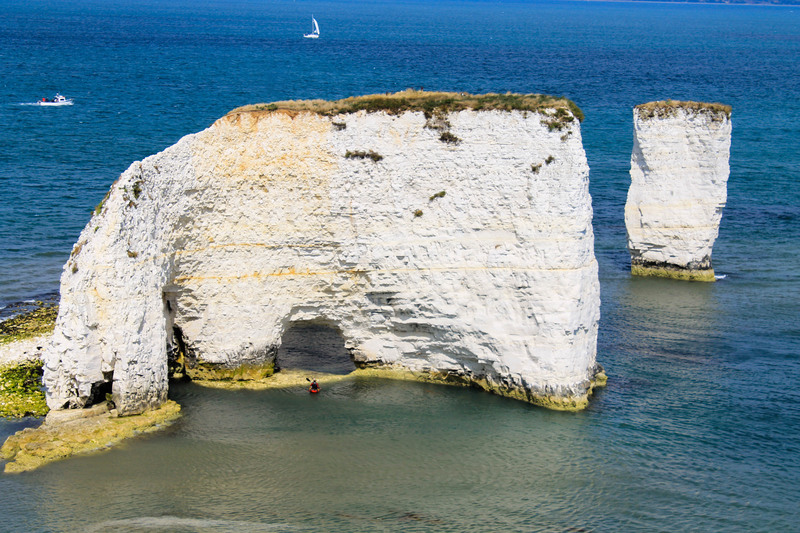 The coast of UK is mostly made of chalk cliffs and here at Swanage it has formed these distinct figures over the years. Air and water gets into little cracks and expands before popping, thus process is called hydraulic action, this forces the crack to become larger. Erosion then wears it away into a cave, then an arch. Soon the top is unsupported and falls off, leaving a stack. As erosion makes the bottom of the stack smaller, it becomes weaker until the stack is unable to support itself and falls away leaving a stump. Today, there is one stack and stump at Old Harry’s. It is well known that the British land mass was once connected to the mainland Europe and here is another shot off from the British isles itself. 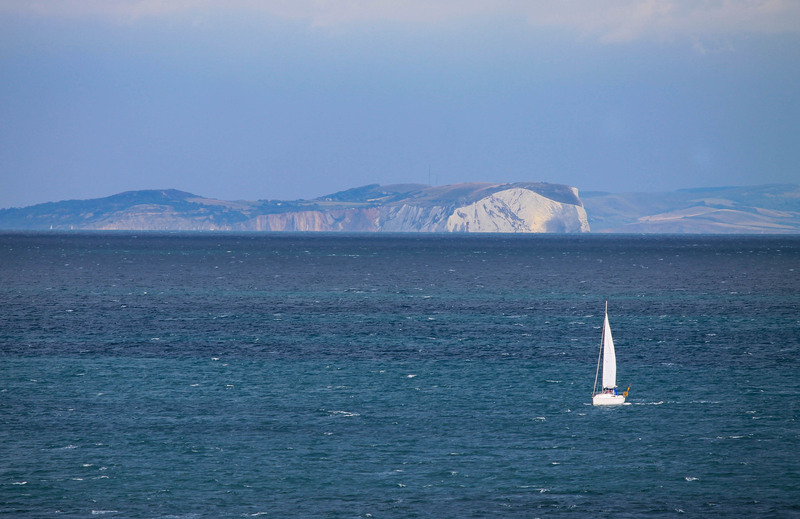 The white cliffs at the distance are that of Isle of Wight which was once connected to the Bournemouth and the wind & waves washed the chalk bridge away and Old Harry’s rocks are the last two bits of the bridge that remain to complete the puzzle! Another interesting fact about this point is that, it marks the eastern end of the Jurassic Coast. The coastal exposures along the 155 mile coastline from here to Exmouth, comprise a continuous sequence of Triassic, Jurassic and Cretaceous rock formations spanning approximately 185 million years of the Earth’s history. Our first day of the road trip was to drive along this Jurassic coast from Swanage to Plymouth with few stops on the way. May be few million years back, even the dinosaurs’ family came sunbathing on this pretty coasts! 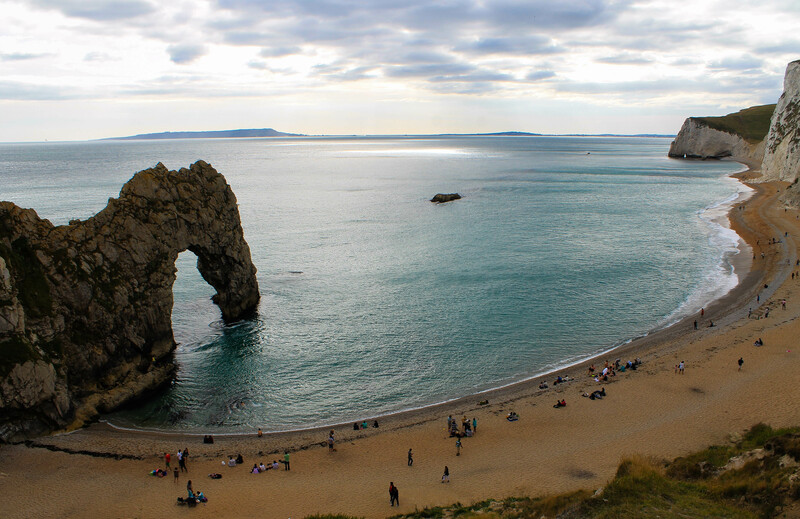 The next stop en-route was one of the most photographed views in the UK or probably even in the world, the Durdle Door. We negotiated through the weekend traffic and arrived at the parking near Durdle Door resort. 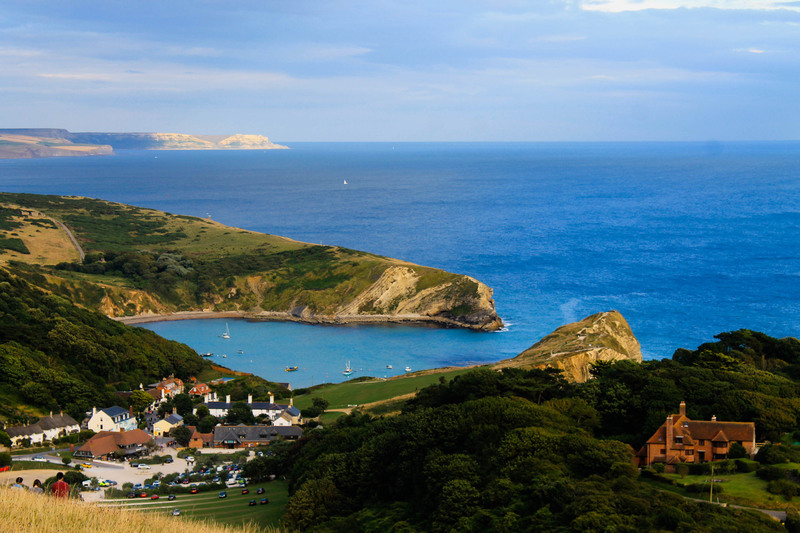 Our plan was to do a round walk covering Durdle Door and the lesser known Lulworth Cove. 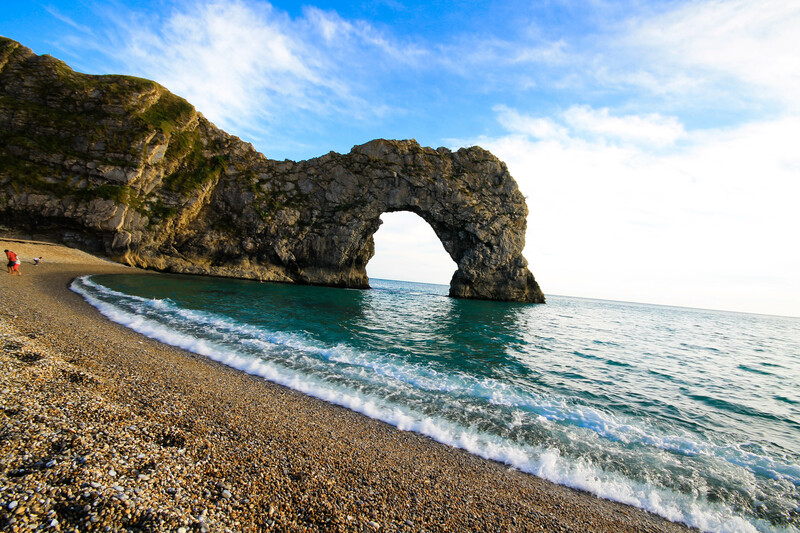 It is another short walk of 15-20 minutes from the parking area to the Durdle Door. A quick, steep roll down the cliff for about 200 meteres and we are at the small ridge that seperates the Durdle Cove on left and Durdle Door on the right and the sight, like none other. As we walked onto the coast, the durdle door was more clear and distinct. There was a big hoard of holidayers relaxing on the shiny pebbles of that coast taking in the views of blue waters and the absolutely amazing Durdle Door. This uniquely shaped limestone arch is indeed a wonder. The waves that splashed onto it over the years are creative for sure! We climbed up the small cliff adjacent to the arch and the views are truly magnificent. Bluish waters coming onto the curved shores is sight to behold. We spent a long time getting to the not-so-cold waters before starting the walk to Lulworth Cove. It was in Bing images that I first saw this marvel on the Jurassic coast. 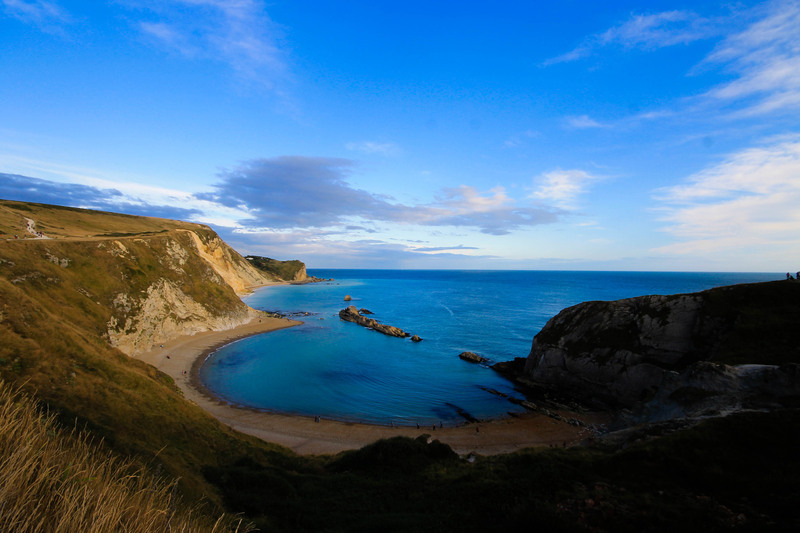 Though not as famous as Durdle Door, this beautiful cove gets enough visitors if not as many. The highlight is definitely the view from up the cliff. 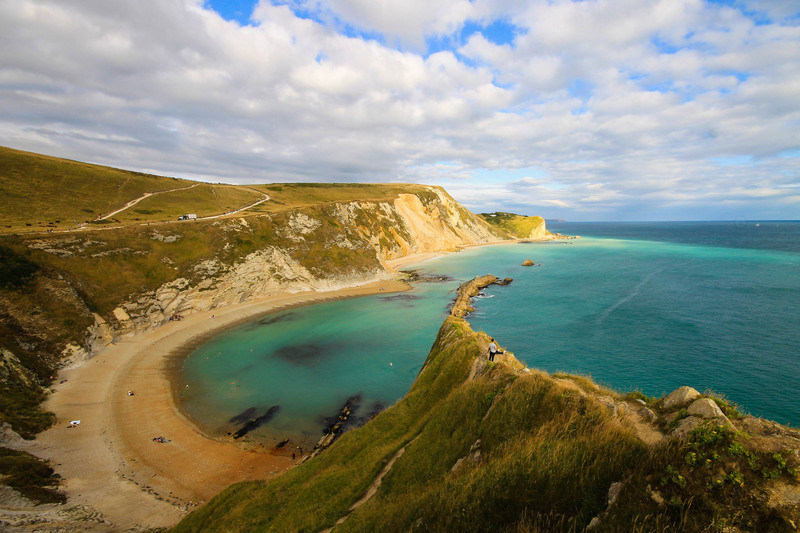 As you walk from the Durdle door parking area on the South West Coast path towards east, the cliff reaches its highest point after a ten minute walk, before climbing down to Lulworth Cove and it is here that the complete view of the cove astonishes with its beauty. The cove has only one not-so-big opening into the sea and is round in shape at other places. From few angles it seems like a huge tank filled up and boats let to float in it. After admiring the views of the cove, we walked back towards the Durdle door parking area. Cornwall – Seagulls, Seashells on the Seashore! Gorgeous photos! Bournemouth was on our “to visit” list when we lived in London but we didn’t make it. Your post makes me regret not making the time to see it. But thankfully we’ve got a return UK trip planned for next summer and Bournemouth will definitely be on the list again! thank you, island girl 🙂 you must sure make time for the southern coast the next time you are here! Personally, I feel this stretch of the coast from Bournemouth upto Cornwall is one of the must see in UK! 🙂 Cheers, Trip On! A great read and some amazing shots, Sam! I ENVY you Mr.Travel photographer….!!! Neighbour’s envy is owner’s pride, Ms. Lost Lander 😉 lol.. I am still waiting to see your Andaman pics and envy again! Gorgeous photographs buddy, keep trippin.